My collection of pet-related photographs has been pretty much assembled on the cheap, and I have missed a lot of great things in auctions because my budget just wouldn’t stand it. However, when I saw this real photo postcard on an auction site, I decided to go for it — and I even managed to outbid someone who tried to “snipe” me at the end. Lee, the otherwise unidentified sender — and, I presume, photographer — of this postcard notes that “This is an actual Photo taken from life” in the right-hand margin. “Oh! Oh! What a difference in the morning.” Real photo postcard signed “Lee.” Posted from Waterbury, CT, 13 October 1906. 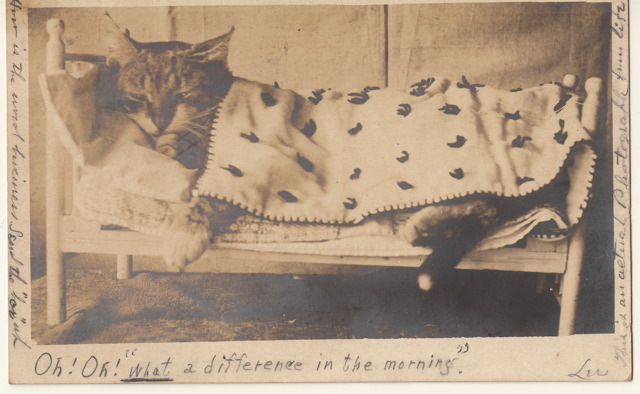 The annoyed-looking feline subject of this photograph is tucked into a doll bed that has a full set of linens, including the knotted quilt that covers him (or her). I used to do things like this to one of the cats of my childhood, and I imagine that many unsung housecats in the past suffered similar indignities. The caption is especially interesting because it references a long-forgotten but very popular theatrical song of the 1890s. “Oh! What a Difference in the Morning!” is a comic lament about hangovers, women whose evening beauty is gone with the dawn, and others who are deluded by the romance of night life. There are multiple copies available online, including in the digital music libraries of the Johns Hopkins University and the New York Public Library (http://digitalcollections.nypl.org/items/510d47dd-edd6-a3d9-e040-e00a18064a99). It was popular in both English music halls and American popular theater; although I’m no music historian, my suspicion is that the American editions were knock-offs. The song has an apparent association with Laura Joyce Bell, an English singer and comedienne who made a very successful career here in the U.S., including performances of Gilbert and Sullivan operettas with her husband Digby Bell. “Oh! What a Difference in the Morning!” inspired additional topical verses in American newspapers and magazines, and the title even shows up in advertisements for mattresses, suggesting that it was a widely-understood humorous reference. Back of postcard. Addressed to William L. Wooding of Bethany, Connecticut. 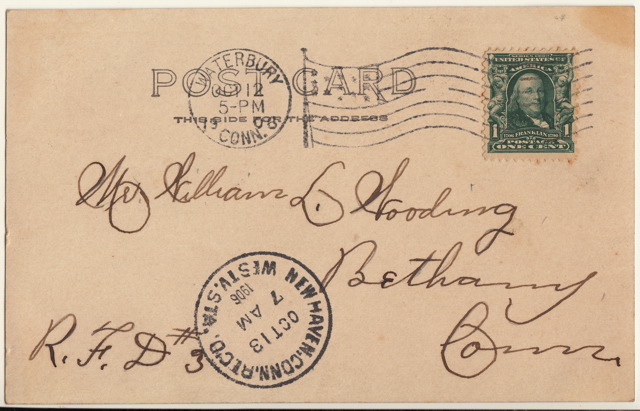 Postmarked Waterbury, CT and New Haven, CT, 13 October 1906. The unknown sender of this photograph was sharing a joke that went far beyond the wonderful photograph he took. Next It’s National Cat Day! I love this photo. It reminds me of my OP, although he would never climb into this bed.